Getting ready for a right old battle! The Gordon Highlanders 1914-1918 are proud to appear again at the World Wars Experience at the National Museum of Flight. 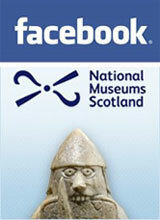 We greatly value our continued relationship with the National Museums Scotland and look forward to doing our best once again, to recreate the life of the soldiers of the Gordon Highlanders during the First World War. 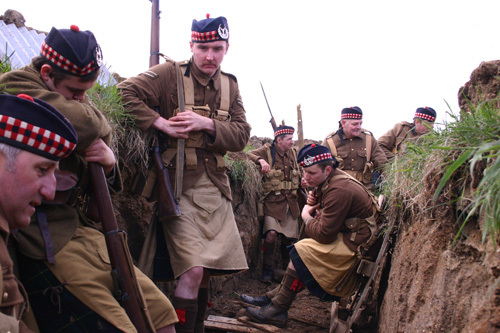 First World War Gordon Highlanders at ease in the trenches. Preparing for an event of this nature involves quite a bit of work behind the scenes. First and foremost, we have to make sure that we know exactly what the organisers want. Each show is different and we need to make sure we tailor our performance to deliver both what is required and what is compatible with the site. We need to work out a programme with the organisers, do a recce of the the site and decide with the organisers, where the camp-site and other static elements of our display will go. First World War Gordon Highlander in the trenches. We find out what PA system is available, and ensure arrangements are in place for food, washing and toilets. We have to decide on appropriate kit for the event, and also whether or not we are able to use pyrotechnics – if so, we have to obtain them. Members are briefed on how to get to the event site and transport arrangements made accordingly. 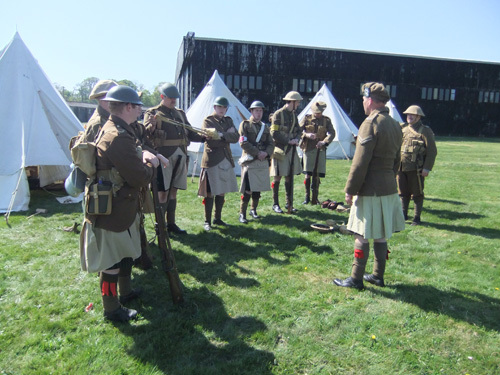 First World War Gordon Highlanders’ camp at World Wars Experience in 2011. An authentic camp-site in which you will be able to meet the soldiers and ask them about their experiences, their uniform and kit. You might even be able to try on the uniform if we have one to fit! A miniature ‘barbed wire’ assault course for the youngsters to crawl through – but beware in case the Germans hear you! Kilts and jackets for the youngsters to try on – we can even take the youngsters for drill – give ‘em some discipline! A set of display boards on the Highland Soldier in the Great War, which we hope to set up in one of the interior spaces. Edna will be providing good old-fashioned beauty advice and wartime cooking tips at World Wars Experience, National Museum of Flight, East Fortune on Sunday 27 May 2012. The two World Wars will come to life with living history presenters and their vehicles, live battles, vintage beauty workshops and posing for wartime portraits! The 1940s are so inspirational for me; it’s the whole hair, make up and clothing. The effort people put in to how they looked really showed. Look at almost any period photo and the women look incredible, especially when you consider the shortages, hours worked and the hardships of war. This might explain why I tend to wear period clothing on a regular basis and I am looking forward to bringing period clothing with me to World Wars Experience. Make do and mend in the Second World War. What I find interesting is that clothes from the 1940s really do not look anything when they are on the hanger, but once worn on a feminine figure, the garment comes to life in a way modern clothes just can’t. However, I do not want to paint a picture of a fashion heaven. Clothes rationing began on 1st June 1941, because there was a major shortage of cloth reaching Britain. Much of that was needed for military uniforms, tents, parachutes etc and government restrictions meant that clothing although simple was of good quality and fairly priced. Rationing coupons where limited to 66 per person a year. That is just about enough to buy one complete outfit. If you fancy a challenge I have listed a number of items with their point allocation, what would you buy for the whole year? The number of ration coupons required per year to purchase items for purchase of clothing: Source Imperial War Museum, London. Another form of rationing during the war and post war years was food rationing and I am looking forward to speaking on this topic at World Wars Experience. Food rationing was brought in at the begining of the war in 1940 and lasted until 1954, an amazing nine years after the war had ended. Despite meals made from pigs’ trotters and a liberal use of cabbage, I plan to explain how our grandparents can tell us a thing or two about cooking today, even though they cooked in a world 70 years ago, in which you were only allowed one egg and three rashers of bacon a week! 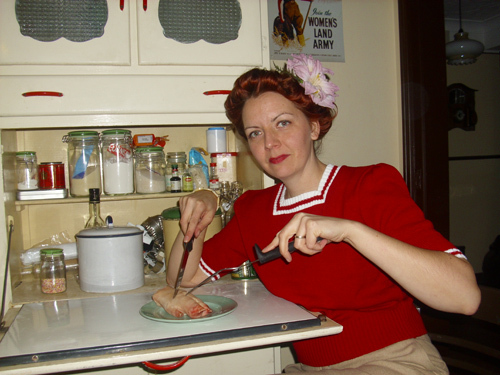 Edna tucking into a pig’s trotter in the 1940s kitchen. 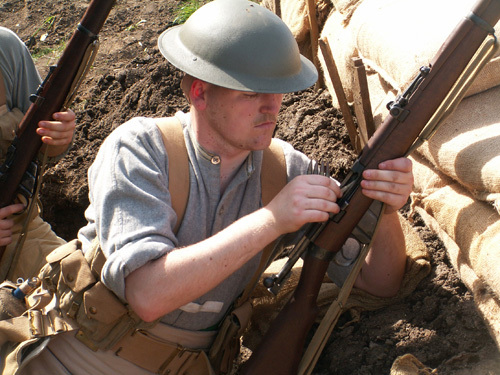 We’re delighted to be asked along to 2012’s World War Experience. We’ll be there with our pop-up parlour as well as 1930s and 1940s demos throughout the day. We’ll be armed with rollers, combs and tongs to do some vintage hair styling. 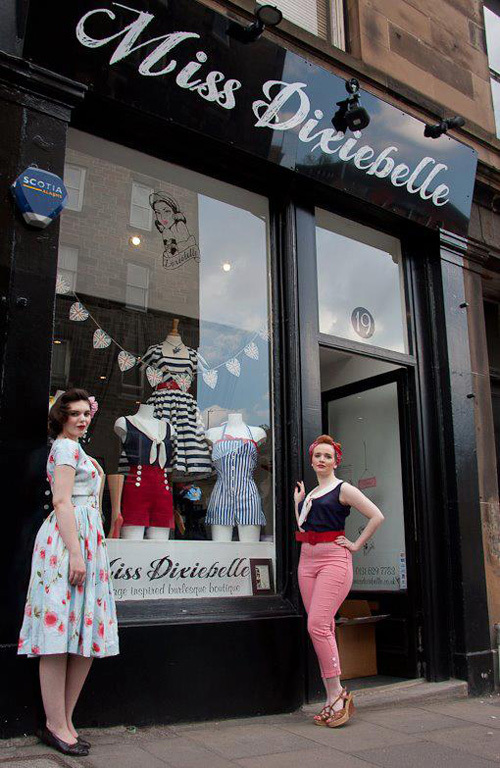 1940s vintage makeover at Miss Dixiebelle of Brunstfield. We can advise on styles dependent on hair type and length and will have plenty of images for you to browse, whether it’s 1940s victory rolls or a classic set that takes your fancy. We’ll be doing this on a first come first served basis so be sure to come early! 1940s vintage look by Miss Dixiebelle of Brunstfield. Our emporium in Bruntsfield is home to vintage-inspired ladies fashion and accessories. We import brands from America as well as British designers and have reproduction garments concentrating on the 1940s, 1950s and early 1960s styles. We have a full range of lingerie and corsetry and our main collections are complemented by vintage luggage and jewellery and hats.